An easy choice this week is a very unique Spalding AAH model glove. The most unique feature of this glove is the stitching that traces the fingers and heel of the glove, somewhat comparable to the hurricane pattern gloves. This one drew plenty of bids, 17, and sold for $2175. 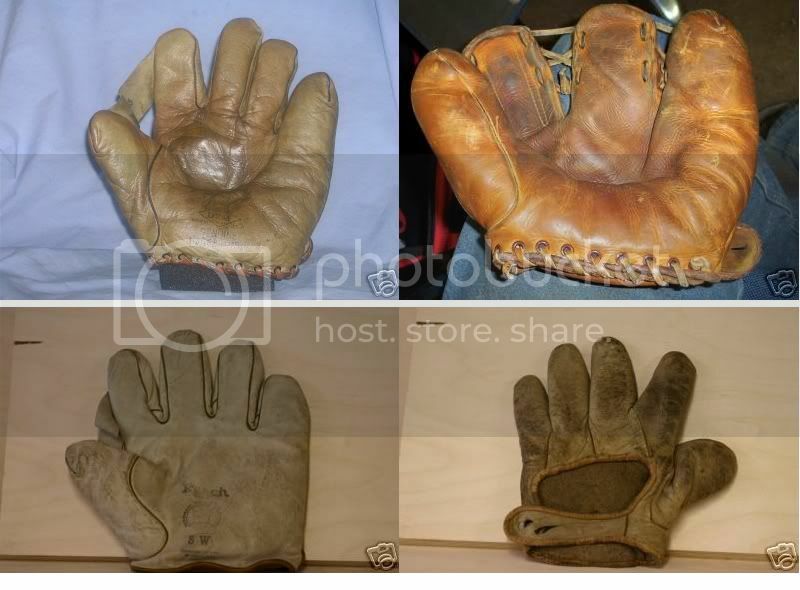 Other nice gloves this past week, starting from the upper left...A beautiful D&M G38 model that went for $690. In contrast to the classic D&M is the MacGregor-GS to the right. I can't remember the model on this one but it does come up from time to time and because of its unique design always attracts plenty of attention. But I'm not really sure what they were thinking when they put this one out. In good condition it went for $162 with 14 bids. A couple of gloves that failed to meet the seller's reserve. A workman style crescent padded glove topped out at $1225. The white Reach SW model (which featured stunning piping and a mint patch), from the same seller got to $710. I am thinking the unusual one is a 2 plus 2 "snare Model" for the MacGregor GS. The other gloves were very cool too. Funny thing about this Snare Model SG. It was actually the second one to come along in about three weeks. The first went for about $130. I guess I should know; I won it. They both looked pretty nice. I'm just glad I nabbed the first one. I really thought $130 was a little on the high side when I won it. After cleaning it up and relacing it in a few places, I'm happy to have it. I guess it could be called one of the first Trap-eze style gloves. MG's best glove sold for $21.25 in 1949. That same year the Snare fielder's sold for $13.20. Still it's a good sized high quality glove. Somewhat akin to the Edsel, it didn't stick and was gone by '51. That might make it more valuable today. I have never owned one of the MacGregor-Goldsmith Snare models. Where do your fingers go? The one I have seems comfortable to place the pinky and ring finger in the pinky finger of the glove and then my next 2 fingers in the glove finger next to the pinky finger of the glove. The thumb goes in the "thumb" of the glove and I put no finger in the finger next to the thumb. I would be able to catch a ball most comfortably with that finger arrangement. Stamped on the front of the finger next to the pinkie finger it states "Place two or three fingers in this section." MG left it to the wearer to decide what worked best . I think two and two feels right. Also looking at pictures of the glove I'd always seen the web finger laced rather tightly to the thumb and the finger on its other side. It wasn't until I loosened up the web a bit that the glove really started to work. 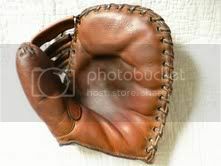 It really is an early Trap-eze style glove. I once had an even older OK Manufacturing Dixie Walker three finger, split finger that had the trap-eze style web. That would undoubtedly be older, but I don't think by much.